Samsung Galaxy S3 Mini looks almost same as its larger sibling but it has not so powerful CPU and it also lacks 4G LTE capability. If you think that this version is same as the bigger version as far as facilities are concerned then you are wrong. This phone is actually another mid range Android phone. We will see some of its features and this is why you can this article as Samsung Galaxy S3 Mini review. Hardware and design: This phone has display of 4-inche with super AMOLED WVGA resolution and according to Samsung this phone has curvy screen. The phone weighs around 111.5inches. Samsung has not yet revealed the variation of colors of this phone but it is expected that it will be available in at least white and blue. It has a smaller 1GHz dual core processor and hopefully this phone will perform well like its bigger version. In this phone the camera is 5 mega pixels with LED flash and also a front faced VGA camera is there. As this phone has no LTE support so it is assumed that it can catch various 3G connections worldwide. The phone has Bluetooth 4.0 and also it has both 8GB and 16GB version. Expandable memory is up to 32GB. OS and Software: Samsung has given it the most recent Android 4.1 Jelly Bean version as OS. There is also S-voice which is the brand of Google’s Voice Actions. There are other plenty of features available in this phone like photo or video sharing with between compatible devices. As this phone has relatively small battery so other features are little battery consuming. Pricing and availability: As far as Samsung Galaxy S3 Mini is concerned, it remains incomplete without knowing the price of the phone. In US market, it is assumed that the price of the phone will vary between $199 but the main focus of the company is to capture the market of Latin America, India, and Middle East etc. So, the price will be fixed according to these markets. Outlook: If anyone wants to compare this phone with the original one then he should not do that. Even Samsung should treat this phone as another Android phone rather than another version of Galaxy S3. Galaxy S3 has already captured a market in the phone industry. Hopefully this phone will be able to maintain the good impression of the Galaxy brand. This is pretty much about the upcoming launch of Samsung. Hope from this Samsung Galaxy S3 Mini review you have got some idea how the phone will be. The author of this article is Lucas Barros, a freelance writer, who writes for helsekost, a Danish Company dealing with herbal medicines and health foods. 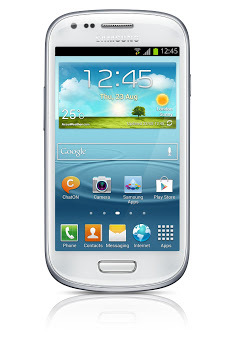 Samsung Galaxy S3 Mini Will Be a great phone for all the users who can’t afford a higher priced Samsung Galaxy S3. All Features like Latest Android, 5MP camera, NFC etc makes this phone a fully loaded device. Samsung Galaxy S3 mini is a great substitute of Samsung Galaxy S3. A great phone with features like NFC and Gorilla glass. Samsung Galaxy S3 Mini Contract is Best Contract offers deals. I was seriously waiting for Galaxy S4 mini but the reviews did not reach up to my expectation but this one seems to be worth waiting for.